The Islamic Charity Project Association (ICPA) celebrated its 25th Annual Ramadan Iftar at Al Amanah College Hall on Friday 18th of May 2018 coinciding with the 2nd of Ramadan 1439AH, under the high patronage of the Islamic High Council of Australia- Darulfatwa. “In this blessed month of Ramadan it is essential that I repeat my call to the global society insisting that we come together to insure that Al-Quds remains an Arab state and the capital of Palestine and to support the Muslim Palestinians in their plight to regain independence”. Such was the purposeful message of Darulfatwa Chairman, His Eminence, Dr. Sheikh Salim Alwan, during his inaugural speech at the ICPA Ramadan Dinner, which hosted nearly fifty government representatives and officials. 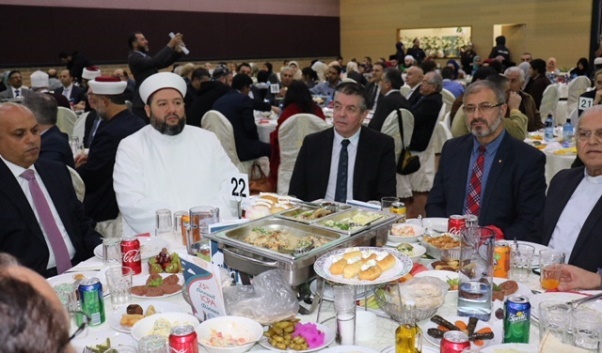 Over four hundred dignitaries and special guests responded to the invitation of the ICPA to pay tribute to the fasting month of Ramadan observed by Muslims globally. Mr. Jason Clare MP, Shadow Minister for Trade and Investment | Shadow Minister for Resources and Northern Australia | Federal Member for Blaxland Mr. Chris Hayes MP Federal Member for Fowler Chief Opposition Whip The Hon Ray Williams MP, Minister for Multiculturalism and Disability Services representing The Hon. Gladys Berejiklian, MP the premier of NSW The Hon Jihad Dib MP, Shadow Minister for Education representing Leader of the Opposition the Hon Luke Foley. Ms. Tania Mihailuk MP Shadow Minister for Family and Community Services, Shadow Minister for Social Housing, Shadow Minister for Mental Health, Shadow Minister for Medical Research, state member for Bankstown Mr. Guy ZANGARI, MP, State Member for Fairfield, Shadow Minister for Justice and Police, Shadow Minister for Corrections, Shadow Minister for Emergency Services, Mr. Paul Lynch MP, Shadow Attorney General Member for Liverpool, Ms. Melanie Gibbons MP, State Member for Holsworthy, Mr. Shaoquett Moselmane, MLC, NSW Opposition Whip, Fr Louis Ferekh Rev.Supt Paul Fryer, Bankstown Police commander, His Excellency Karim Medrek- Ambassador of Morocco, Ms. Noura Saleh, First Secretary Palestinian Embassy ,Mr. Yasser Mahmoud ABED, Consul-General of Egypt, Mr. Mayer Dabbagh- Honorary Consul of Syria, Mr Anthony Khouri - Honorary Consul of Bangladesh , Mr. Mahmoud Al Mashhadani - vice Consul of Iraq ,Mr. Nurlan ZHUNUSBEKOV,Consul Kazakhstan, Mr. Hideaki Matsuo - Deputy Consul-General of Japan ,Ustaz Muzafar Ikmal Saaid Cultural consul of Malaysia Hajjeh Zani Consul culture of consulate of Indonesia Sydney , Demila Gabriel Consul of Bosnia and Hursic in Sydney, Ms. Farida Yasmin - counsellor Bangladesh High Commission, Bushra Salam Consul of Pakistan in Sydney, Mr. Sam Kayal - Labor party, Cameron Murphy - Labor candidate for East Hills, Rachelle Harika - Councillor of Canterbury Bankstown City Council, Councillor Gus Balloot – Liverpool City Council, Deputy Mayor Cr Ali Karnib – Liverpool City Council, Councillor Charishma Kaliyanda– Liverpool City Council, Councillor Masood Chowdhury - Campbelltown City Council, Deputy Mayor Cllr Tina Ayyad representing the Mayor of Liverpool City Council, Councillor George Zakhia – Bankstown City Council, Cllr Bilal El-Hayek representing the mayor of Bankstown City Council, Councillor Geoff SHELTON - Liverpool City Council, Councillor Linda Downey Mr Alan Ashton , members of the NSW police force, community leaders, sheikhs and imams, educators and principles, media practitioners and representatives, scouts members and representatives, Lebanese political party representatives, and businesspersons. A blessed recitation from the Holy Qur’an unfolded the evening. Following was a recitation of the National Anthem performed live by the Al-Amanah College Choir, receiving a standing ovation from the crowd. The evening exuded an aura of compassion to the suffering Muslims around the world as the MC, Principle of Salamah College, Mr. Ayman Alwan, paid tribute to the millions who have been displaced by conflict and struggle. The evening carried a clear message to all of humanity, echoed in the series of speeches and video clips of the ICPA and Darulfatwa – ‘we must all reject sedition, violence, bigotry and dictatorship and we must stand for truth, compassion and social harmony in dealing with one another’. “Ramadan is the month of reflection, devotion, generosity, sacrifice and sympathy extended to those who experience shortage of basic needs. “Ramadan is the month of compassion, understanding and consideration. “This month the fasting Muslim is strongly encouraged to feed others, visit others and show consideration towards the less fortunate by visiting to sick, widowed and orphaned. “The month of Ramadan compels one to leave the evil doings and adopt habits of benevolence. My message to our graduate Sheikhs tonight is to call people to the right path using wisdom and kind dialogue and to avoid harshness when offering advice and guidance. “What a great trait it is to be loving, merciful, compassionate and kind to people. “What a great trait it is to work collaboratively with one another to provide the community with a vaccine of true Islamic knowledge. “It is such knowledge that will always stand as the antidote for ignorance in the same way that moderation stands against extremism. “My Premiere wishes me to extend to you peace and goodwill throughout this Holy Month of Ramadan. “25 years ago no one used to really talk about Ramadan, 25 years ago no one used to open up their doors, and people didn’t understand what Ramadan was. “And look at what we see here today; we see Consuls; Consuls Generals from Bangladesh; Egypt, and Pakistan; we see members of Parliament-local, state and federal. We see Mayors, former Mayors, current Deputy Mayors. “What I also love is that we see part of Australia; we see the emergency services; we see scouts; we see the community at large. “Ramadan is observed by 1 in 4 people around the world; by hundreds of thousands of Muslims in Australia. “But it’s important to every Australian because it gives us an opportunity to walk in your shoes; to learn more about your faith. to the Hon. 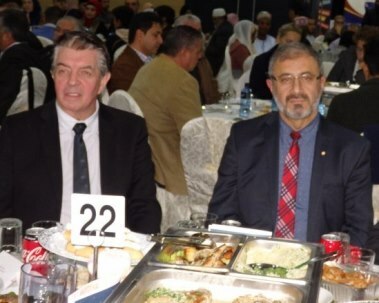 Shaoquett Moselmane MLC for his long-standing service of 36 years in the Labour Party and involvement in the community. “It is a real honour to receive this kind recognition from ICPA and Darulfatwa. I have been involved in the Labour Party now for 36 years and I’ve been involved with many communities; but let me tell you that ICPA and Darulfatwa are not just community organizations – they are community builders. “As you’ve seen, the number of schools, community institutions, the number of mosques, you’ve also got 2MFM; and the number of other institutions they have developed over the years is truly a mark of a community organization that is building communities. “I recognize them for their fantastic work. Congratulations for everyone who is involved in the ICPA and Darulfatwa. “Today marks 70 years since Palestine was stolen. “And today as well Jerusalem is about to be stolen. “It’s up to the Muslim community, it’s up to you and up to everyone to stand up and oppose the theft of Palestine and the theft of Jerusalem. 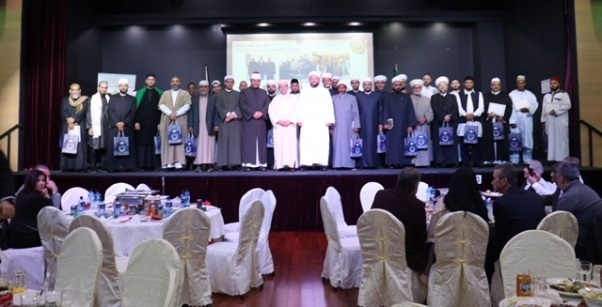 The final feature of the night was the official presentation of graduation certificates from Darulfatwa to the imams and sheiks of the community who completed courses in Egypt and in Australia, training them to be imams of moderation, good example and intellect. This illustrates the successful efforts of Darulfatwa Australia in its call for action to achieve social cohesion and harmony through knowledge. 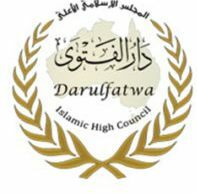 Darulfatwa Australia has been working in partnership with Al-Azhar of Egypt to qualify suitable religious teachers and imams with the necessary teachings allowing them to respond to their call of duty and extend the true knowledge of Islam to everyone. Dr. Sheikh Salim Alwan, Dr. Al-Shelh OAM, and Mr. Yasser Abed, Consul-General of Egypt, were called to the stage to present the 2018 graduates including 6 trained imams from Al-Azhar and 25 trained imams from Darulfatwa Australia, with certificates of recognition and appreciation.